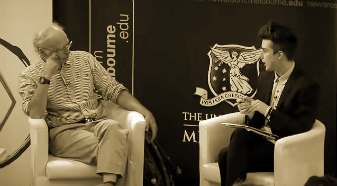 In 2012, the University of Melbourne hosted a public talk between Professor Peter Singer and Daniel Lewis-Toakley on poverty not only in Australia but in the world at large. Professor Singer spoke about the challenges in understanding global poverty and the nature of our ethical responsibilities toward the world’s 1.4 billion living under the poverty line. Professor Singer first noted the difficulty in speaking about what poverty means for those living in it without degenerating into broad generalizations. While some, he argues, will be in extreme poverty other will be more fortunate and have widely different opportunities. In most cases, poverty relates to a condition of insecurity in relation to life’s vital necessities, whether for instance one is going to have food on the table not only on a given day but also for the immediate or foreseeable future. For others, it may mean being in a weak position in relation to the law, if there is law at all, or indeed situations of exploitation by persons in position of excess power where there is no redress, or lack of the basic infrastructure(s) that can make farming and trade profitable. And also for these reasons, it is radically a different thing to talk about poverty in a developed country than to speak of it in developing ones. Thus the kind of desperation and hopelessness that defines what poverty means to the world’s 1.4 billion is contextualized by a lack of seeing a way out (or what is called the poverty trap), the lack of the basic protections of law, social security nets, safe drinking water and free education that many developed nations provide to their citizens for free. Much of the work that the Millennium Promises Foundation led by economist Jeffrey D. Sachs and Ray Chambers have approached global poverty in these terms in empowering for instance local villages for instance in acquiring fertilizer to grow crops at a higher yield. In thinking about our responsibility to help the world’s poor, Professor Singer concedes that it is rather difficult for human beings to be altruistic enough, with only the exception of a very few cases, to voluntarily give large monetary sums and give up their luxuries for others whom they have never met. What we need to focus on however is to make campaigns and our solutions to global problems progressively scalable and ensure that participants play not only an active part but also see a greater amount of people participate in them. Professor Singer argues that the more people participate, the more the likelihood that that number can increase. He notes how for instance the Life That You Can Save website, based on his book published under the same title, achieves this by progressively scaling income charity contributions based on one’s income earned and simultaneously pledging future income contributions that help donors feel they are “living reasonable ethically in regard to global poverty”. For Professor Singer, this responsibility however extends to being effective in terms not only donating monetary sums to social campaigns and evaluating organization and social campaigns to support but also assessing the balance between educating the public and practical work to which people can donate. In the first aspect of his (utilitarian) ethics, Professor Singer argues is a response to the criticism of the ineffectiveness that is often perceived of charities and NGOs. He also makes reference to the Givewell.org website which evaluates the extent and scope of the efficiency of monetary contributions and organizations not only as a model for assessing organizational work but also for assessing which causes deserve more attention. The educational and practical balance is never perfectly achieved throughout the life of a social campaign. In speaking about the experiential aspect as a way to bridge both, in particular of the aims of replicating a sense of hopelessness and insecurity of living in poverty in the Living Below the Line campaign, the experiential is never quite replicable in the sense that the insecurity of living below the poverty line can never be quite the same in vital aspects. Professor Singer still believes however that while research suggests that monetary contributions can be the most effective means to help fund solutions to the global problems of poverty, the value of the experiential model, in that of the LBL campaign for instance, provides an additional emotional aspect that is complimentary to the monetary contribution that can “empower you through the long term”, create a sense of solidarity with the world’ poor and can potentially also “change your life”. Professor Singer further argued that studies have shown that altruism is in actuality a behavior that is supported by a peer group and community. Thus doing more than monetary donations is quite important in creating the long term conditions for peer groups as well as participation in them.